To welcome you to Adpro, we are offering 10% off your first order placed with us. Discount applies to regularly priced orders only. Not to be combined with any other offer. Offer valid for new customers only. Please print this page and present prior to placing order. We realize that there are always ways to save money on everything, but with savings comes sacrifice. But compromising on service and/or quality doesn’t have to be the case. Throughout the entire year, we will be continuing our first ever Price Match Guarantee. Bring us a written or printed estimate from any of our competitors on any product we offer, and we will match that price! We’d Love A Referral! If you were happy with your experience at Adpro, we would greatly appreciate you telling others about us. Give them this coupon (make sure to write your name on it) and when they spend $250 or more, they get 10% off and you get a $25 gift card to your favorite restaurant or retail store. Offer applies to new referrals only. Discount applies to regularly priced orders only. Not to be combined with any other offer. Please print this page and present prior to placing order. Pete and his staff are professionals in every sense of the word. No mater what the design requirements, quantities, or material, Adpro delivers. Their service and turn around time is exceptional. 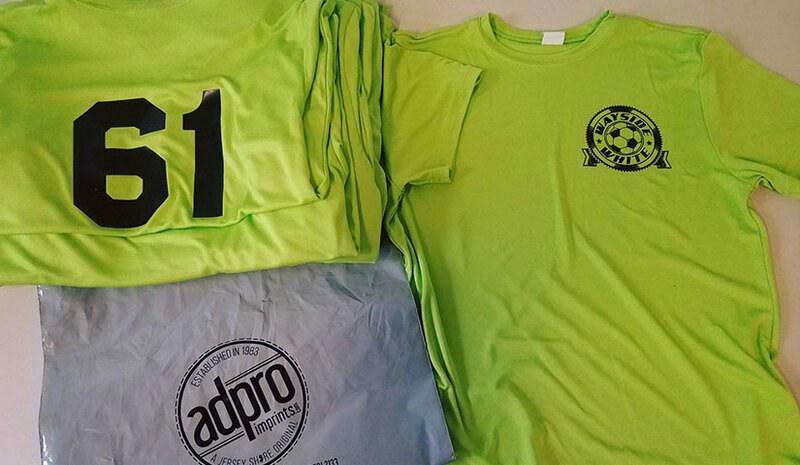 I have been ordering my shirts from Adpro for the past 4 years and will continue to do so. We are a family based print studio local to the famous Jersey Shore, conveniently located on Rt 35 in Ocean Township. We are open Monday-Friday 8:30-4:30, and evenings by appointment only. Copyright 2018, Adpro Imprints, Inc. All rights reserved. Site by Splendor.